Blowout Sale! 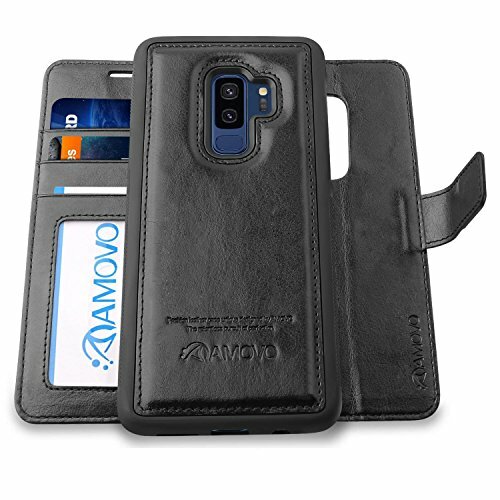 Save 78% on the AMOVO Case for Galaxy S9 Plus [2 in 1], Samsung Galaxy S9 Plus Wallet Case [Detachable Wallet Folio] [Premium Vegan Leather] Samsung S9 Plus Flip Case Cover with Gift Box Package (Black, S9+) by Amovo at Got Busted Mobile. MPN: s9pluskechai-black. Hurry! Limited time offer. Offer valid only while supplies last. [2 in 1 Detachable Design] Perfect Combination of a Wallet & Cell Phone Case. Detachable Magnetic Shock-absorption back cover. [Wireless Charging Supported] Simply place down the Detachable Inner Case on the Wireless Charger Pad. Tips: Once the charging is done, you'd better install the Wallet Layer to get more Protection. [Bump & Drop Absorption ] Made by Premium Selected Vegan Leather (Outer Cover) & Quality PC+TPU (Inner Case), This Folio Cover succeed in absorbing bump & resisting damage from Accidental Drops. [Built-in Holders] Multiple Cash & Card Slots in this Classic Cover allows you to carry your ID & Credit Cards & Debit Cards & Cash with you at All Times. [Precise Cutouts] Easy Access to All Buttons & Camera & Speakers & Connectors. This slim form-fitted Wallet Case is precision designed to add Minimal Bulk & retain the Stylish Outlook of Your New Samsung Phone. If you have any questions about this product by Amovo, contact us by completing and submitting the form below. If you are looking for a specif part number, please include it with your message.